This Is What A Scientist Looks Like: My Submission Is Finally Up! Posted in Things I like. Bookmark the permalink. My school has a lovely “frog pond” by the Arts Center, but it hasn’t had frogs in it for the past couple of years. 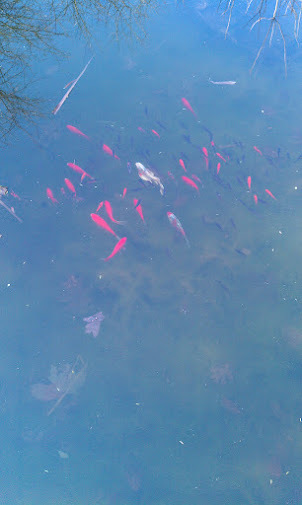 This time last year, the school put some koi fish in and forgot about them. This was after I got my infamous koi tattoo, so I bonded with them very quickly. My favorite is a bruiser named Fred. I was pleasantly surprised when the fish, who were ignored during the winter, emerged (mostly) unharmed during last week’s big melt. The pond is shallow enough that it sometimes freezes all the way down, but we did have a mild winter…so there were probably only a couple inches of ice at most. In fact, there was a whole host of new fish…babies had grown into teens, teens had grown into adults, and all these little buggers who’d been practically microscopic in the fall were swimming around being adorable. Two of the striped fish (named Benny and Jenette) seem to have had babies together. Benny and Jenette’s babies are…special. I’ll try to get a video of this at some point, but here’s a brief explanation: The striped babies all float up at the surface, sometimes on their sides, and look quite dead. Then, they’ll start twisting around, doing acrobatics and otherwise looking like they have some kind of neurological tic before they swim off and repeat the process somewhere else. My friend Paige and I have created a name called “Dead Fish Dumb Fish”, where we call out when we see a fish that could either be dead or just spastic. Does anyone know what’s going on here? Google tells me parasites cause odd movement, but all the baby fish who do this look alike…so I’m just going with the hypothesis that Benny and Jenette made themselves a spastic batch of babies. Maybe their home life is especially stressful. Today, there was more good news: Oodles and oodles of eggs! 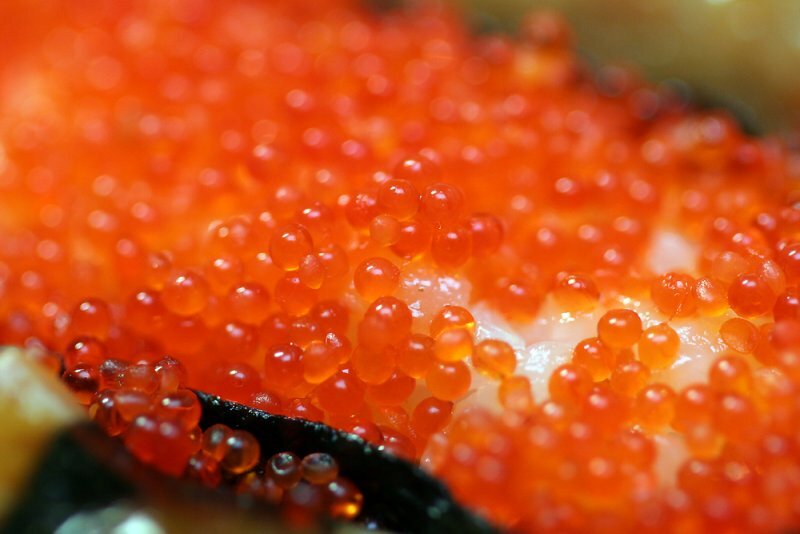 Like this, but on reeds instead of on sushi! We spotted five big clusters without looking very hard, so we’re potentially talking dozens of baby fish. The internet tells me that fish often eat their first few batches of eggs because they’re “still figuring things out”. If Fred eats the babies, I’m cutting off his banana bread supply for at least a week. In all seriousness, I think most of the fish in the pond have spawned successfully before…so hopefully they know what they’re doing. I’m looking forward to seeing the process, though I’ll probably miss the hatching as our break is next week. Pictures to follow! 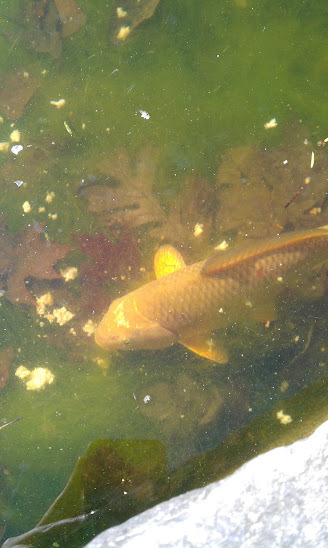 Posted in Uncategorized and tagged babies, fish, fish eggs, koi, koi pond, spawning, spring. Bookmark the permalink. During the first weekend of February break, I attended the annual meeting of the American Association for the Advancement of Science. My press badge allowed me to rub elbows with several up-and-comers in the world of scientific research, and most of the attendees I talked to were just as inquisitive about my life as a “science writer” as I was about their lives as “scientists”. Everything was about as professional as I’d expected it to be until the guys from Argonne National Laboratory asked for a swab of my feet. More specifically, they handed out plastic baggies full of sample tubes and sterile q-tips, and they asked a room full of reporters to dirty them up using their shoes and cell phones. This foot-rubbing occurred at the press briefing for the Home Microbiome Study, an effort spearheaded by Daniel Smith, a postdoc in the Computing and Environmental Life Sciences center at Argonne. Running out of the prestigious national lab in Chicago, Smith is trying to figure out how stable the colonies of micro-organisms that live on us are. 90% of your body is technically bacteria. Don’t be freaked out by the high number. Neigh, bask in the knowledge that you carry independent and thriving civilizations upon your shoulders (and toes, and eyelashes, and tongue, etc) every day. Recently some groups like the Earth Microbiome Project have begun to examine just how many different micro-organisms live on our planet. This project intends to analyze the genomes of as many organisms as possible in order to catalogue them. The Home Microbiome Study has a smaller, but perhaps more relevant, focus. This year, a number of families who are moving into new houses in the Chicago area will be part of a fascinating study. Smith and his colleagues will take samples to observe what kind of micro-organisms live on them currently, and they’ll then see how these colonies interact with the colonies living in the new houses. In other words: When you turn on the same light switch every morning, are the micro-organisms living on that light switch colonizing your fingers? Or are the micro-organisms on your fingers colonizing that light switch? An interesting question, and one that’s never really been asked before. Sort of a chicken vs egg situation, in my opinion. My feet? Covered with bacteria, as well they should be. Interestingly enough, my shoes have more in common with other people’s shoes than they do with my cell phone. The data is interesting, and presented in really pretty colors, so I’m excited to see what else the project comes out with. Posted in Uncategorized and tagged AAAS, anl, argonne national lab, earth microbiome project, home microbiome, microbiome. Bookmark the permalink.